Content marketing is the driving force behind a lot of the new technology that is online today. Yet, there are a lot of businesses that have a live website, but are not taking advantage of any kind of content marketing to drive traffic to their site. They may have invested in keywords and SEO when they developed their website, but the reality is they are not getting many people to take a look at their site because there is nothing steering them to the site. In my last article, I talked about the components of good content marketing – the content of content marketing, if you will. In this article, I want to focus on the purpose of content marketing. In the previous article, I defined content marketing as being any sharing of information, from an organization or an individual, that lends advice, opinions or other valuable information in the area of their expertise. What are we gaining by just giving information away without trying to sell someone? Can that really be classified as marketing? The answer to the second question is, yes, if you work it correctly, content that you are giving away can be very effective marketing – and it is nothing new. For instance, in many technical fields where there is a need for continuing education, oftentimes vendors are invited into what is commonly called "lunch and learn” sessions. The idea is not to do a hard sell, but to educate your customers. They, in turn, see you and your company as the voice of expertise – and that is where the value of content can be turned into marketing. That expertise builds a level of trust that pays off when it comes time to choose someone from whom to make a purchase. Would you rather buy from the expert or someone you don’t even know? We have been using the testimonials of experts as a marketing method for decades. Think about buying a new car. How many car commercials have you heard that touts the number of experts who have awarded them the "best” new car for this or that? Those awards are used as a marketing ploy to get you into the auto dealer’s showroom. Now think of your website as being the showroom of your business. What causes someone to browse your site? What is the marketing device that gets them there? Content is that device. However, we often get customers who see content marketing as nothing more than fluff to fill up the internet and they have no time for it. To be honest, a lot of it is fluff. Your content needs to be engaging or it will be ignored. (See my previous article.) But often these types of comments come about because someone has the illusion that content marketing will lead directly to a sale. When it doesn’t work out quite like they expected, they deem it worthless. The problem is in your goals, not the medium. 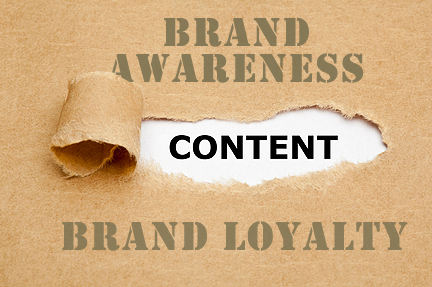 Content marketing is not designed for the hard sell of getting the customer to make a purchase. Content marketing is used to do two valuable functions on either side of the sale. One is to make potential customers aware of your brand, products and services. The other is to retain the customers you have. Again, think of your web site as your showroom. Most of our customers have not stepped foot in our offices, but all of them have been to our website. Websites are primarily used in marketing to make people aware of what you do and become familiar with your brand. Content marketing does the same thing. What is the goal of awareness marketing? It is to help the prospective customer to gather enough information about you that they understand what you are selling and can identify your brand with those products or services. Transitioning the potential customer to a make a purchase is part of the next step of marketing, but is not part of awareness. Content marketing can also be used for retention marketing after the sale. We often use a case study method to content marketing. We will pick out a customer and write about how they used a product or service to solve a problem. When you are publishing good comments about your customer, you are making a strategic marketing move to make them customers for life. In a subtle way, you are gaining a testimonial from the customer without getting them to say anything – their use of your products and services written in a case study is an endorsement. Content marketing works. Make sure you are setting realistic goals for your content. Done right, it will be the entry to your website and the reason customers keep coming back to you after the first sale.